Quantity of item required. Cable is quoted in metres. Extension Leads Used on construction sites due to its outstanding flexibility and excellent coiling characteristics in cold conditions. Power For machine tools, construction and engineering equipment and conveyors. Conductor Annealed plain copper stranded extreme flexibility (Class 5 & 6). Operating Temperature Range Fixed -20°C to 90°C / Flexing -5°C to 75°C. Maximum Conductor Temperature 90°C. (Current ratings are based on 30°C air temp. See technical section for de-rating factors). Rated Voltage Uo/U 300/500v. Max AC Operating Voltage Uo 318v. Minimum Bending Radius Fixed 5 x cable diameter / Flexing 6 x cable diameter. Sheath Colour Black, Orange. (Blue, Yellow in 3 x 1.5mm² only. Subject to availability). 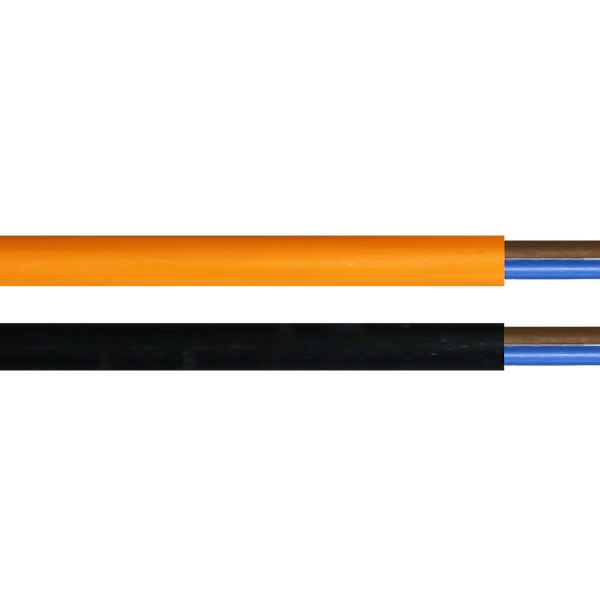 2 core – Blue, Brown. 3 core – Blue, Brown, Green/Yellow. 4 core – Grey, Brown, Black, Green/Yellow. Relevant Standards AS/NZS 3191, IEC 60227, IEC 60332-1, AS/NZS 3808, AS/NZS 3008, ROHS Compliant. 58 Rangi Rd, Takanini, Auckland.